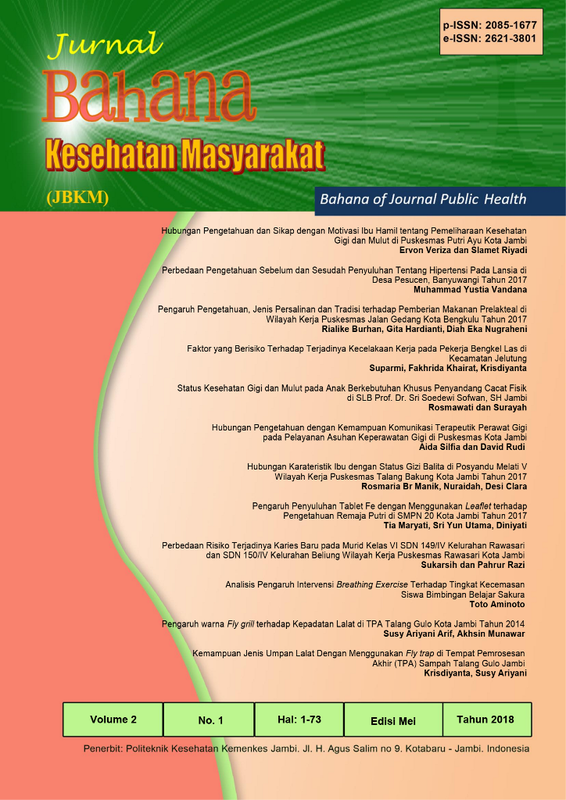 Jurnal Bahana Kesehatan Masyarakat (Bahana of Journal Public Health) is a new name from Jurnal Poltekkes Jambi which has been published regularly every 6 months since 2009 with some improvements in the cover, contents and layout. This journal is published by Poltekkes Kemenkes Jambi which contains research results and scientific articles in the health sector. Jurnal Bahana Kesehatan Masyarakat (Bahana of Journal Public Health) provide a forum for lecturers and health practitioners who will publish the results of their research, so that they are expected to contribute to health development. See Google Scholar Profile for Buletin of Jurnal Bahana Kesehatan Masyarakat (Bahana of Journal Public Health) by clicking here.